Developers: Omiya Soft, JAMSWORKS Co. Ltd.
Culdcept Revolt is a card game that’s almost similar to monopoly with a hint of Pokémon and Yu-Gi-Oh!. You play as a Cepter, someone who can use the magic cards, who lost his memory and tries to regain it at all costs. He meets the “Free bats”, a rebel group, on his journey to recover his memory. The story is really nice and makes it more than just a board/card game. So if you like a story, board games and card games this might be the game for you. The main character Alan (or how the player names him) wakes up confused. His name being the only thing he can remember. Suddenly a voice speaks to him and explains that he is a Cepter. 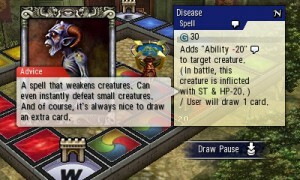 A Cepter is someone who can use magic to control the cards of Culdcept. Cepters can teleport to a battle space when they invoke a battle. The mysterious voice turns out to be Alicia, the leader of the Free Bats. After explaining the way of the Cepters to Alan, she takes Alan to the Free Bats’ hideout. A hideout is needed because in the city of Celphas Cepters are pursued and killed. This chase of Cepters started due to Count Kraniss. He is an evil tyrant and a very powerful Cepter who rules over the city. The city of Celphas’ gates used to be open and looked out over a great and free landscape. Those gates are now sealed shut and prevent the freedom of everyone inside the city. All because the Count wants to eradicate all other Cepters. Alicia dreams of leading her rebel group, the Free Bats, to freedom outside of the city. Sadly, this isn’t as easy as it sounds because the city is heavily guarded by the Count’s underlings. A plan has been devised by Alicia and the Free Bats tough. They are going to try to escape on the day of a festival when the gate isn’t so heavily guarded. Alicia invites Alan to join them and try to escape with them. 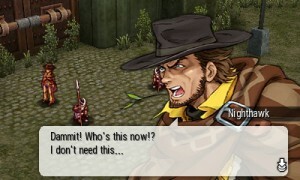 Culdcept Revolt has an anime style. Some parts are more detailed like the conversations were the character who’s speaking is shown with a close-up. All the cards are nicely detailed and some are really pretty whereas others are really creepy. 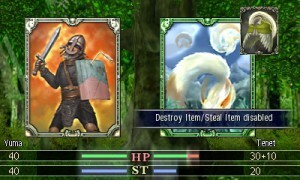 The characters in-game including the summoned card characters are more pixelated when not enlarged or inside the card. Even though they are quite little and more pixelated they are still very detailed on the board. 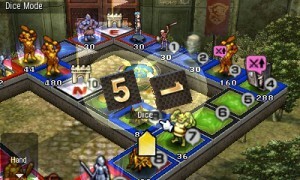 The boards where the actual card game is played on stays fairly the same with colors of every element: fire, water, earth, and wind. There are some other special places as well but other than the layout nothing really changes there. All the backgrounds used in the storytelling part are nicely in theme with the anime theme. They aren’t highly detailed but still pretty. Since the game is on the 3DS (unless you play on the 2DS) there is 3D available. When the characters speak with the typical visual novel dialogue there is a nice feeling of depth. When creatures fight against another there is also a more immersive feeling because the special effects pop even more. Even the opening of the game is nice with the extra feeling of depth. The developers used the 3D nicely and it really adds to the game. 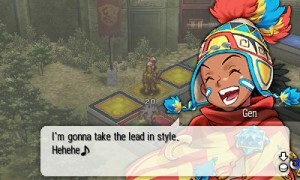 The music in Culdcept Revolt is more classical and has a more almost “old castle” feel. This fits the game because the city is situated around a castle. The soundtrack is mostly instrumental and only goes up a beat ever so slightly when creatures fight another or something happens in the story itself. 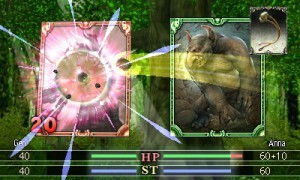 There are a lot of distinctive sound effects present in Culdcept Revolt. Magic isn’t magic without cool sound effects. Creatures make groaning noises when they fight. Voice acting for the characters isn’t present but there are voices that act more informative almost like a moderator is present in-game. Culdcept Revolt is a strategy board/card game with an immersive storyline. You start the game off with a lengthy tutorial. Which is actually quite nice to have as the game would be quite complicated without it. The storytelling between the board game part is almost like a visual novel. 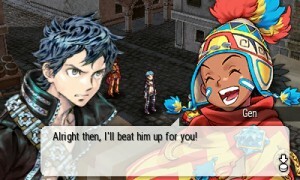 In the Battle space, the characters do give reactions on par with the storyline and as a reaction to you or other opponents’ turn. The story is well told and makes you feel for the characters and just really adds to the experience. Sadly, when you lose in the battle space you have to re-read the entire story without a skip button available. Luckily you can adjust text speed. You can also adjust walking speed and the speed from opponents turn. 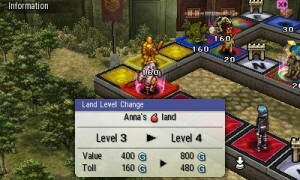 Which is really necessary because levels are quite long because of the lengthy battles. 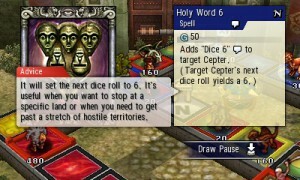 Culdcept is a board game and card game in one where you summon creatures with magic to take territory. You have four elemental territories on the board; fire, water, wind, and air. The creatures can have 5 elements though with the fifth being “neutral”. Most creatures can be placed on any elemental space but if the land matches their element they get a land bonus. Some creatures can’t be placed on certain element lands. Neutral can be placed everywhere but logically doesn’t receive land effect. This doesn’t always mean that neutral creatures are weaker. Almost everything in the battle space costs magic. The goal you need to achieve is also a sum of magic but this sum is the total magic. Total magic is the value of your territory, current magic and gems combined. Your current magic is the magic you have available for spells, summonings, upgrades and to pay toll to other players. 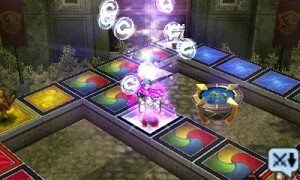 This magic is called G and is mostly collected by starting a turn, passing a gate and collecting toll from other players. When you summon creatures on a territory you claim that particular land as yours so when other players land on it they have to either pay toll or try to defeat your creatures. This sometimes seems like Monopoly where you also buy “land” and people have to pay you when they land on your space. Much like Monopoly, you can upgrade your land when your creatures aren’t fatigued. This increases the value of your land, the toll can be collected and your total magic. When you just place your creatures, upgrade or move them they become fatigued and can’t be changed till you pass a gate. There are multiple gates present on the board and when you pass all of these you get a lap bonus. Every gate gives the player extra G but only the first time. The gates reset when you make a full lap by passing every gate. 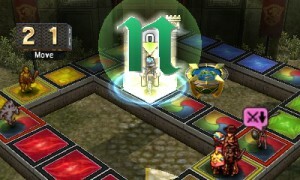 G isn’t only used for summoning creatures or upgrading territories. 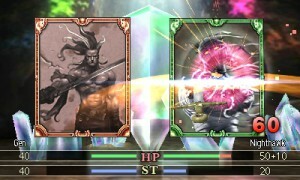 It’s also used to use spells and use items in a battle. There are spells for every occasion; to steal G from opponents, to set yours or the opponents dices to a specific amount, to strengthen your creatures, … Some of these spells can really come in handy if you’re in a pinch or just want some easy extra G. Some impressive spells cost a lot of G but others cost nothing. When you have to pay toll and don’t have enough magic you’re forced to sell enough land till you have G value of 0 or above. If you don’t have enough territory or collectible gems to be able to pay your debt you are declared bankrupt. Bankruptcy or Magic depletion starts you over at the start with lap bonus x 1,5. When you reach the total magic goal ( which is mostly around 8000 G) you have to get as fast as possible to a gate. This makes you the winner of the battle. if you have to pay a huge toll or opponents cast a spell on you and your magic goes below the goal before you reach the gate you don’t win, so plan ahead. This game is all about the right strategy and a tad of luck. 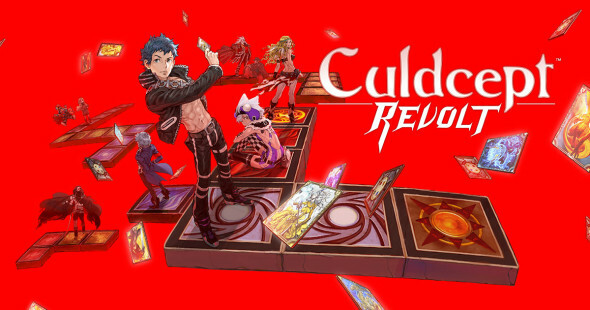 Culdcept Revolt isn’t just a board/card game as it has a really well-written story with nicely developed characters. Sometimes it resembles other games but that just makes it all the more familiar and easy to remember. This game sometimes requires some strategy and it takes a lot of time to finish a level. The length of the levels doesn’t get boring though. A fun storyline really helps that fact. Plus, the more you learn about the game the more fun it is to crush your opponents. So if you like board games or/and card games or even just a good story; you should consider giving this game a try!